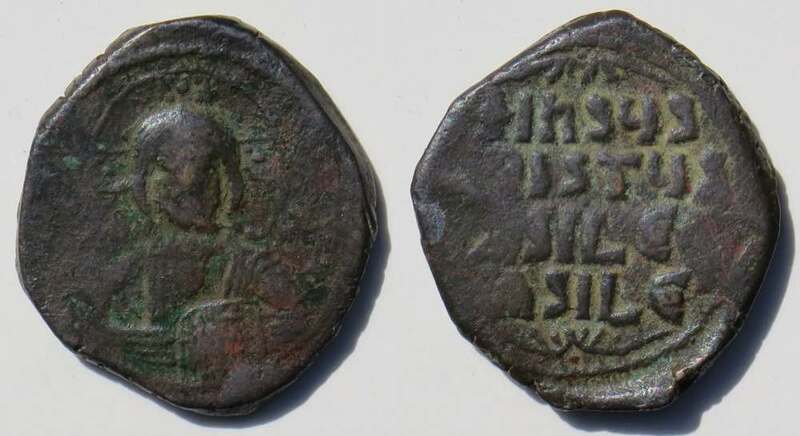 John I, 969-976, was the first emperor who did not issue copper folles in his own name. 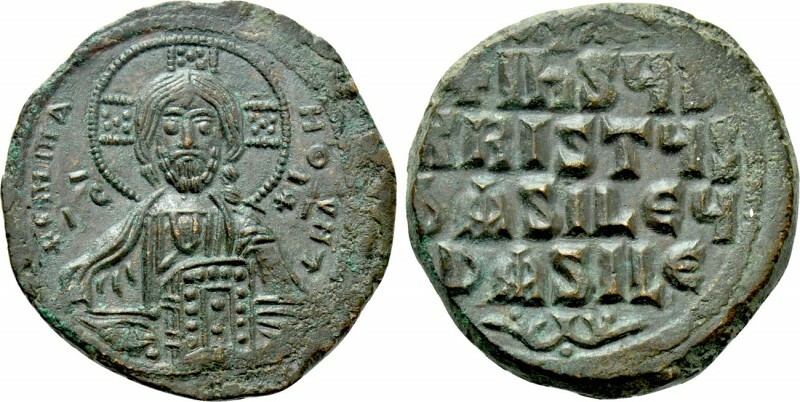 Rather, he began the "anonymous follis" series with the first Byzantine copper type to portray Christ. This is mentioned by Byzantine historians of the time who wrote that the motivation was the extreme piety of John who wished to honor the Savior [Grierson, DOC, page 634]. Also, Grierson [BC, page 204] wrote "It may have also been regarded as useful as religious propaganda in provinces newly reconquered from the Arabs." 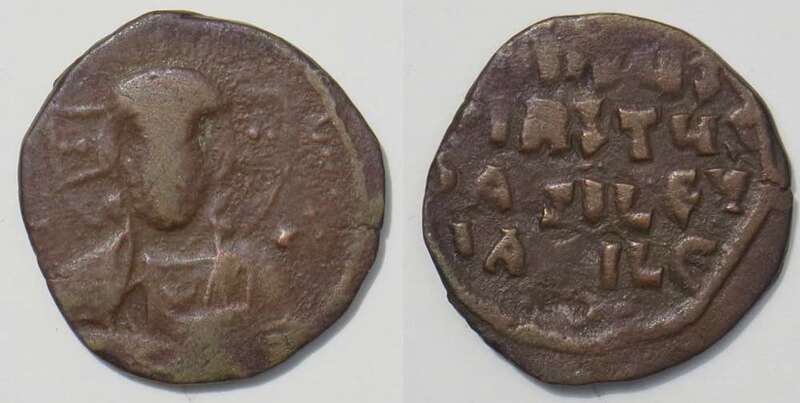 The type has a facing bust of Christ, IC XC on either side, nimbate with two dots in the limbs, with no imperial name, and a four-line reverse legend. The type is Class A and his coins are Class A1 which have the same basic design as, but are smaller than, the later Class A2 coins. "The probable identification is the bust of Classes A, B, E, H, I, and K, where the Gospel book is supported from beneath ... and Christ's right hand is held to the side of His body in the sling of the cloak. 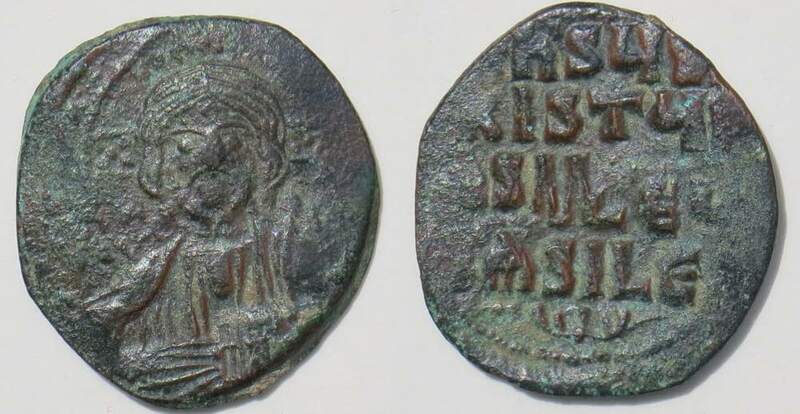 This is a probably the gesture of the standing Christ of Chalke, greatly venerated by John Zimisces, which would explain its introduction on coins." [Grierson, DOC, page 636]. Class A1: Class A1 is usually 5-8 grams and 20-25 mm. 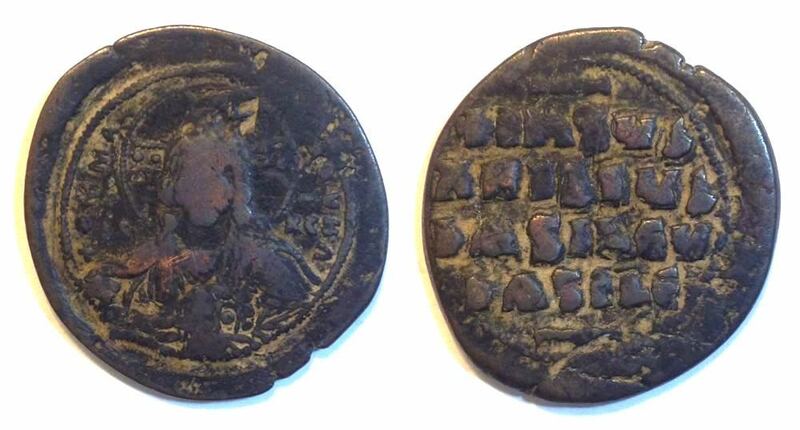 It is almost always overstruck on coins of Nicephorus II (963-969), Constantine VII (913-959) or Romanus I (920-944). Facing nimbate bust of Christ with two dots in each limb. with no decoration above or below. Comment for collectors: In my experience more than half the coins offered as Class A1 are actually just Class A2 pieces offered by sellers who don't know the difference. Class A1 is scarce and maybe even rare. It is hard to find one with the flan large enough for the full reverse legend. Class A2: A coin reform greatly increased the size of Class A1 coins without changing the basic design. We call the new larger coins Class A2. Because they are larger than previous coins, they are not overstruck. 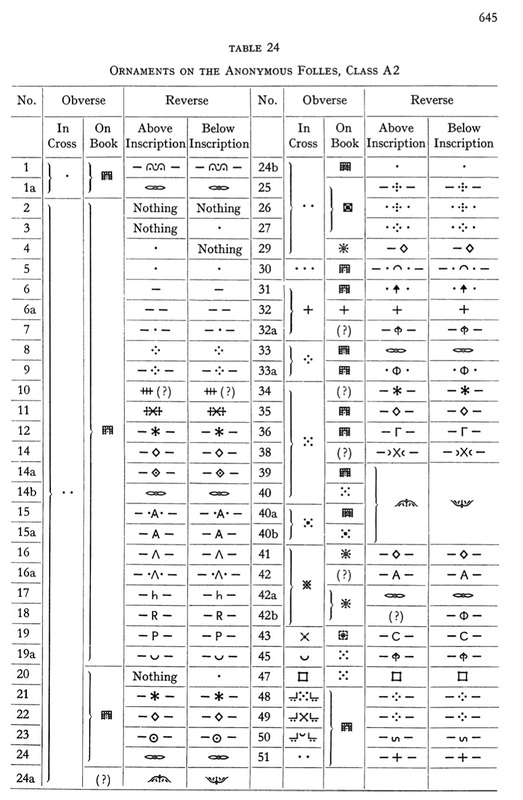 Class A2 folles are very common and come with over 60 varieties of decorations in the nimbus, on the gospels, and above and below the reverse legend (see the table of decorations below). In contrast, Class A1 always had two dots in the nimbus and no decorations above and below the reverse legend. Class A2 comes in all sizes up to 35 mm and as small as 25 mm (but still thicker and heavier than Class A1 coins). The largest ones were the earliest reform issues that replaced the small Class A1's. As usual, inflation caused the sizes to gradually decrease. [This paragraph is repeated from the main page] Metcalf (1970, 1979) proposed a Class A3 with no change in design but a reduction in weight to about 2/3 the previous weight, that is, a weight of about 8 to 11 grams. He also proposed some were minted at "central Greek" local mints. He makes the distinction between Class A2 and Class A3 using weights, style, and find locations. Certain ornament varieties in the table are given to Class A3 and some to central Greek mints. He notes that older publications misclassify many Class A3 coins as Class A1 because coins with light weights that did not fit into Class A2 were put into Class A1, but with his scheme could be put into Class A3 using the ornaments above and below the reverse legend to make the distinction. 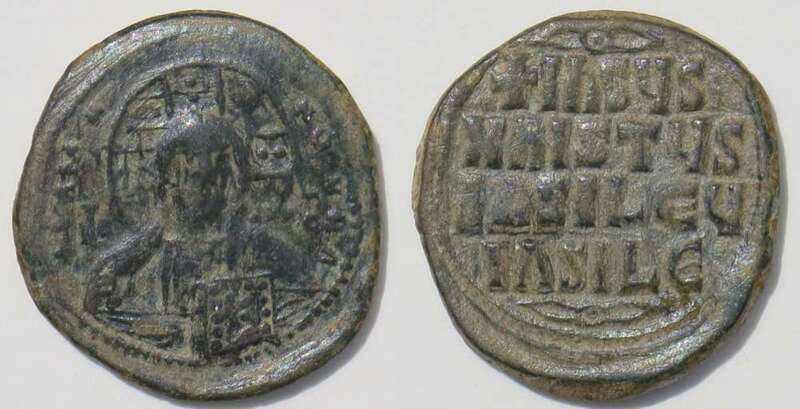 For details, see Coinage in South-Eastern Europe, 820-1396. Although Sear mentions Class A3, most sources have chosen to lump all sizes of Class A coins after Class A1 into Class A2 and omit Class A3. This page ignores Class A3 and consolidates it into Class A2. Examples here are ordered largest to smallest. 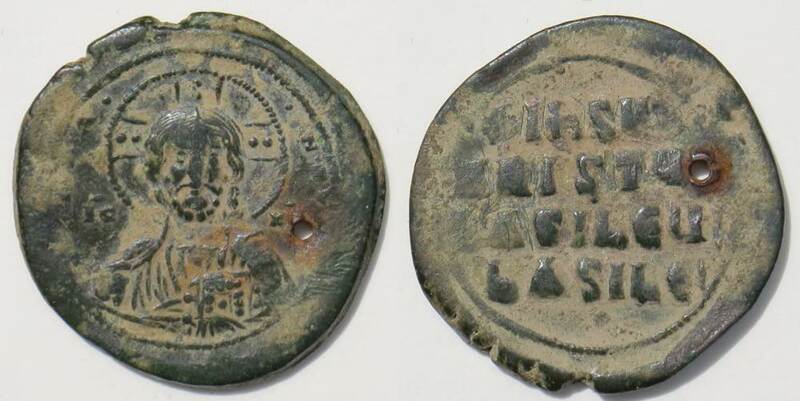 Obverse: A facing bust of Christ with a large halo (nimbus) and +EMMA-NOVHA (Emmanuel) around. He holds the Gospels. Small IC XC either side (for "Jesus Christus". "X" is a chi in Greek, the first letter of "Christ" in Greek. There are various symbols in the nimbus). There are various ornaments (in this table) above and below the legend. Very large and heavy. 35 mm. 19.76 grams. and a curved decoration with three dots. Variety 1 in the table below. This is likely one of the first A2 coins of the reform. Large. 35-32 mm. 21.73 grams. Heavy! Five dots in the nimbus. Variety 39-40 in the table below. Bar above and below the legend. Variety 6 in the table below. Crosses in the nimbus, on the gosples, and above and below the reverse legend. Variety 32 in the table below. Another example of the same variety. Holed, but with better facial features than most. Variety 20(?) in the table below. but has better facial and hair features than most. Variety 24 in the table below. Note the complex "A" forms on the reverse. Note for Collectors: This coin is in extremely high grade, which makes it very unusual for the type. It is worth twenty times as much as the same type in typical grades like most of the other Class A2 coins on this page, even with the off-center reverse. If the reverse were also well-centered, the price would double again. A brockage restrike of Class A2, Sear 1813. The head of Christ is incuse on the reverse. It is upside down in the main photo and rotated to be rightside up in the small photo. This is a very remarkable restrike of a brokage, maybe even the most interesting extant and certainly the most dramatic example I have seen. Brockages have one side an incuse version of the other. When coins were struck sometimes the coin stuck to the upper (pile) die and its obverse relief served as the pile die for the next coin, making an incuse obverse where there should have been a reverse in relief. The larger the coin type, the fewer the brockages. A heavier coin is less likely to stick to the upper die. If the coin falls off, as it should and almost always does, the next coin won't be a brockage. Some brockages were restruck. When the minting error was noticed, mintworkers could have used the recently-struck coin as a flan to strike again and get it right. There is not one here, but maybe there is a coin where there is evidence it was a brockage, but restruck correctly to almost erase the evidence of the error. High relief on the original obverse makes for a deep depression on the incuse side of a brockage. If that coin is restruck, in might be that the reverse die does not have enough relief to reach into that depression and obliterate that part of the brockage strike. Byzantine bronze was struck with die-axis 180 degrees. The top of the obverse is the bottom of the reverse. The high-relief head of Christ made a deep depression on the bottom of the reverse. 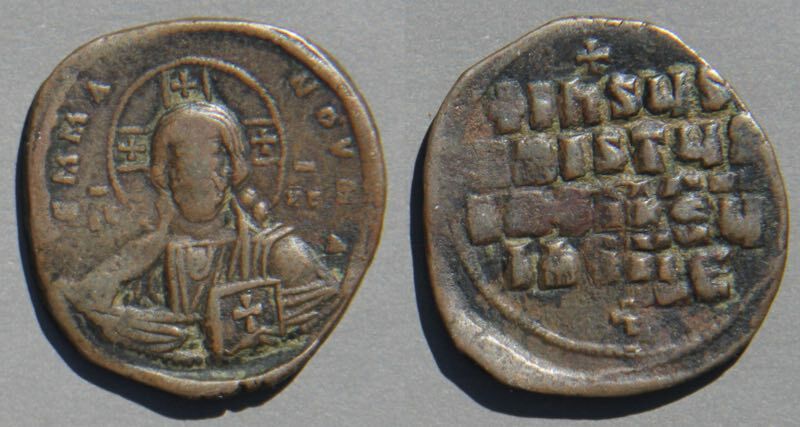 Byzantine quality control is usually not high, but this time they caught the brockage error and restruck the coin. The obverse lined up nicely and looks like a single strike. 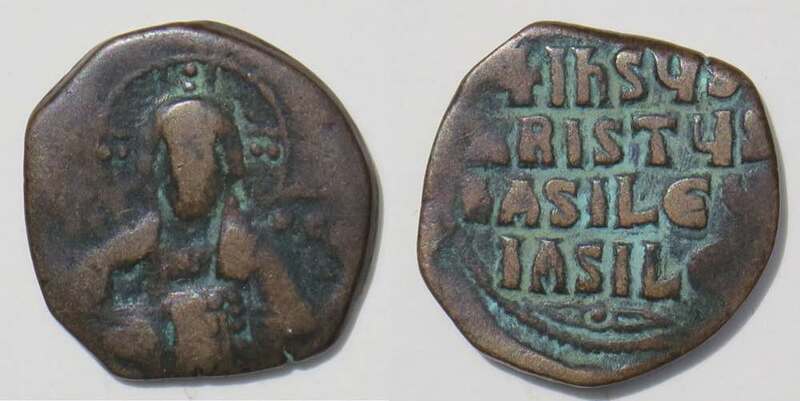 The reverse is as well struck as most anonymous bronzes, but the depth of relief of the reverse die (which has only lettering) was not enough to reach down and delete the deeply incuse head of Christ. Turn the reverse upside down and Jesus Christ, King of Kings, stares out at you as shown in the upper right detail. A Possible Half-Follis. The next coin is an oddity with the type of Class A1 but a much smaller beveled flan of only 17 mm. Only 17 mm and 4.16 grams. The flan is not cut down from a larger coin because it is beveled (unlike other Byzantine coins) as you can see on the image. The obverse with two dots in the nimbus is like that of Class A1 and the early issues of Class A2. The reverse die, presumably with four-lines of text, was too large for the flan and only parts of three lines show. Berk, catalog 200 (Jan 8, 2017), lot 380 was a coin much like this, 4.28 grams with unstated diameter and two dots in the nimbus and reverse too small to see if anything was above or below the legend. He wrote, "Half folles are rather rare and unrecognized in literature, but because of the small flan and small image they can be nothing but that denomination." However, it looks overstruck on a reverse type with only a legend, but he did not comment on the overstrike and I am not sure what the undertype is. That brings up the possibilty that some Class A1 folles used flans from earlier types that were too small for the dies and these are not half-folles, rather they are poorly made Class A1 folles. There are many varieties of Class A2 folles. Volume 3, part 2, of the Dumbarton Oaks Catalog has this list on page 645 (reproduced with written permission). Note: Variety 1 is the largest and probably the first, but the others are not arranged to be in chronological order. For example, variety 39 (illustrated above) is among the largest and probably earlier than almost all the others.) Some other varieties have been discovered since this volume was published in 1973. Type 2 on this list is very similar to Class A1 (as are varieties 3-5 and 20), but Class A1 is usually distinguished from A2 by its lack of ornament on the reverse, its smaller size, and its lighter weight. Return to the main page on anonymous folles. Go to a page devoted to Classes B-K.